When you are shopping for caster wheels for carts, you need to find the right features for your applications. The wrong kind of caster will not work as well when moving your items. A poorly-chosen caster can also damage your equipment and injure your workers. Some important features include: wheel size, weight capacity, and wheel locks. Most commonly, manufacturers refer to the diameter of the wheel. So, if you have 4 inch caster wheels, the wheels are four inches are diameter. The larger the caster wheel diameter, the more easily a cart rolls across the floor. Larger wheels also move more easily over dents in the floor’s surface. For greater stability, however, you may prefer smaller wheels in some situations. By choosing the right size wheel, you make it easier for your workers to push and pull the carts. Workers can experience muscle strain injuries if they have to work too hard to move items. To avoid having a caster break off of a cart, causing the cart to tilt and dump its contents, you want the casters to be strong enough to handle more than the cart’s maximum load. The caster’s dynamic weight capacity needs to be adequate for the speed and frequency with which you expect to use the cart. There should be a safety factor added to the weight capacity calculations. For standard casters on carts that do not tilt, you can assume that each caster will handle an equal portion of the weight load. For tilting carts and leveling casters, you need to account for the possibility that all of the weight of the unit could be shifted onto only a portion of the casters. Overloading weight capacities risks injuring your employees. Total wheel locks and floor locks allow you to set a cart in one place, so that it will not shift suddenly. Locks may come with caster wheels, or be purchased separately to be added to casters. Floor locks may be used to make an item level on an uneven surface. Locks are an important safety feature to prevent injuries from unexpected cart rolling. 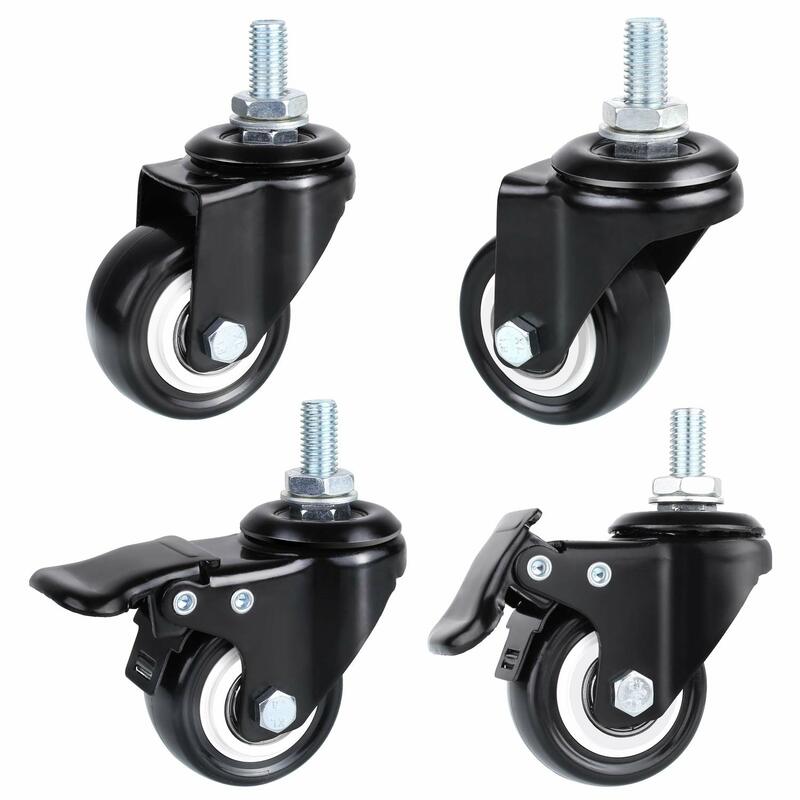 Be careful to select casters for carts that take into account the most appropriate wheel size, adequate weight capacity, and wheel locking mechanisms. Incorporating good design decisions on the front end will prevent injuries and equipment damage. It would be prudent to consult with a dealer that specializes in casters before your purchase.